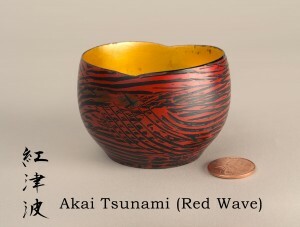 “Akai Tsunami” was begun on the second anniversary of the Fukushima Tsunami in Japan. There is a raised cone in the bottom of the piece to symbolize the sub-oceanic volcanoes that surround and threaten that island nation and its people. The indentations in the lip represent the mountains and valleys of Japan. 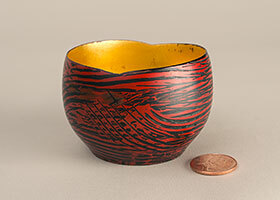 The finish is my adaptation of the Wakasa nuri decorative lacquer technique and, as with all lacquer finishes, serves as structural support for the thin walls. The gilded interior has been left with a feeling of wabi-sabi, intentional imperfection, to represent the scars left in Fukushima. Indeed, this is the thinnest walled piece I have ever created, being similar in thickness to an eggshell, representing the fragility of our home planet.